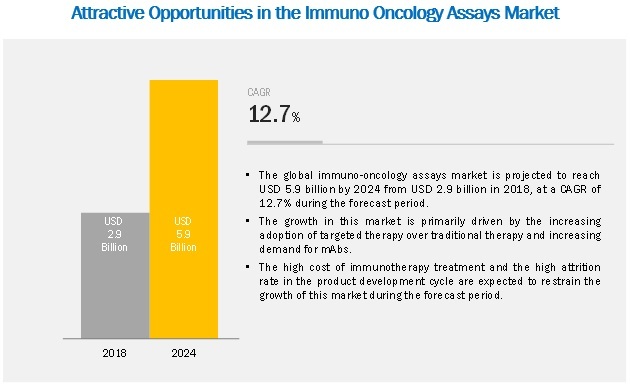 [108 Pages Report] The market for immuno-oncology assays is expected to reach USD 5.9 billion by 2024 from USD 2.9 billion in 2018, at a CAGR of 12.7% during the forecast period. The growth of this market is primarily driven by factors such as the increasing adoption of targeted therapy over traditional therapy and increasing demand for mAbs. However, the high cost of immunotherapy treatment and the high attrition rate in the product development cycle are the major factors that are expected to restrain the growth of this market during the forecast period. By product, the consumables segment is expected to be the fastest growing in the market during the forecast period. Based on products, the immuno-oncology assays market is segmented into consumables and software. The consumables segment dominated the market with the largest share in 2018; this segment is also expected to register the highest CAGR during the forecast period. The large share of this segment can be attributed to the availability of a wide range of reagents and kits, increasing use of reagents in different oncology therapeutic treatments, increasing research on cancer immunotherapy biomarkers and its applications in drug development, and easy accessibility to a wide range of reagents. By application, the research applications segment is growing at the highest rate. Based on application, the immuno-oncology assays market is segmented into research applications and clinical diagnostics. Research applications dominated the market with the largest share in 2018. It is also projected to be the fastest-growing segment during the forecast period. 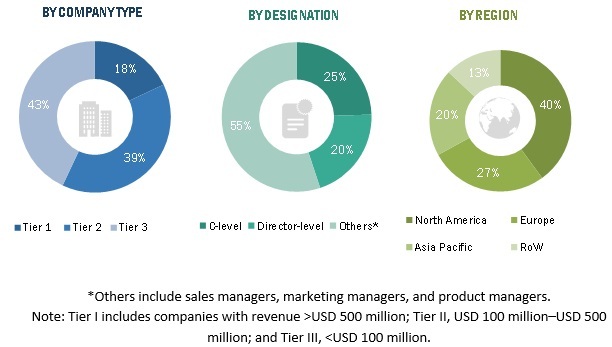 The rising prominence of biomarker-based drug development and clinical trials and the emergence of cancer immunotherapy are the key factors driving market growth. The immuno-oncology assays market is divided into four major regions— North America, Europe, Asia Pacific, and the Rest of the World (RoW). Asia Pacific is estimated to grow at the highest CAGR during the forecast period. The growing number of CROs in the region, increasing awareness about early detection of cancer, and the shift of manufacturers’ and suppliers’ focus from developed economies to emerging economies are some factors supporting the growth of this region. The key players operating in the immuno-oncology assays market are Thermo Fischer Scientific (US), Roche Diagnostics (Switzerland), Agilent Technologies (US), and Illumina (US). In 2018, Roche collaborated with SQZ Biotech to develop antigen presenting cells-based immune-oncology treatments. In 2018, Illumina launched its TruSight Oncology 500 assay, which is used to identify known and emerging tumor biomarkers. In 2018, Roche acquired Tusk Therapeutics to expand its oncology product portfolio. In 2018, Agilent acquired ACEA Biosciences (US). This acquisition will help both the companies to focus on real-time, live-cell analyzes through their expertise in cellular function and metabolism measurements. In 2016, Thermo Fisher collaborated with Invivoscribe Technologies to develop NGS-based in vitro diagnostic oncology tests. Who are the major market players in the immuno-oncology assays market? What are the regional growth trends and the largest revenue-generating regions for the immuno-oncology assays market? What are the major drivers and challenges in the immuno-oncology assays market? What are the major product segments in the immuno-oncology assays market? What are the major application segments in the immuno-oncology assays market? What are the major technology segments in the immuno-oncology assays market? What are the major indications for immuno-oncology assays? 12.8 HTG Molecular Diagnostics, Inc. The study involved four major activities in estimating the current market size for immuno-oncology assays. Exhaustive research was conducted to collect information on the market as well as its peer and parent markets. The next step was to validate these findings, assumptions, and sizing with industry experts across the value chain through primary research. Both top-down and bottom-up approaches were employed to estimate the complete market size. Thereafter, market breakdown and data triangulation were used to estimate the market size of segments and subsegments. In the secondary research process, various sources such as Bloomberg BusinessWeek, Forbes, and Dun & Bradstreet were referred to, so as to identify and collect information useful for a technical, market-oriented, and commercial study of the immuno-oncology assays market. These secondary sources include annual reports, press releases & investor presentations of companies, World Health Organization, World Bank, Centers for Disease Control and Prevention, National Institutes of Health, Canadian Institute for Health Information, National Cancer Institute, European Association for Cancer Research, Australian Cancer Research Foundation, GLOBOCAN, and American Cancer Society. Secondary research was mainly used to obtain key information about the industry’s supply chain, the total pool of key players, market classification, and segmentation according to industry trends to the bottom-most level and regional markets. It was also used to obtain information about the key developments from a market-oriented perspective. Key players were identified through extensive secondary research. The immuno-oncology assays industry’s value chain and market size, in terms of value, was determined through primary and secondary research. After arriving at the overall market size—using the market size estimation processes explained above—the market was split into several segments and subsegments. To complete the overall market engineering process and arrive at the exact statistics of each market segment and subsegment, data triangulation and market breakdown procedures were employed, wherever applicable. The data was triangulated by studying various factors and trends from both the demand and supply sides of the immuno-oncology assays industry. Thermo Fischer Scientific (US), Roche Diagnostics (Switzerland), Agilent Technologies (US), and Illumina (US). 10 major players covered, in total.